Algae: the eternal problem every aquarist and shrimp keeper has to deal with sometimes. Although no fish or shrimp can completely wipe out an algae infestation and you should avoid turning to live animals to help you clean your tank, there are a few shrimp out there that can definitely lessen the amount of scrubbing you need to do. 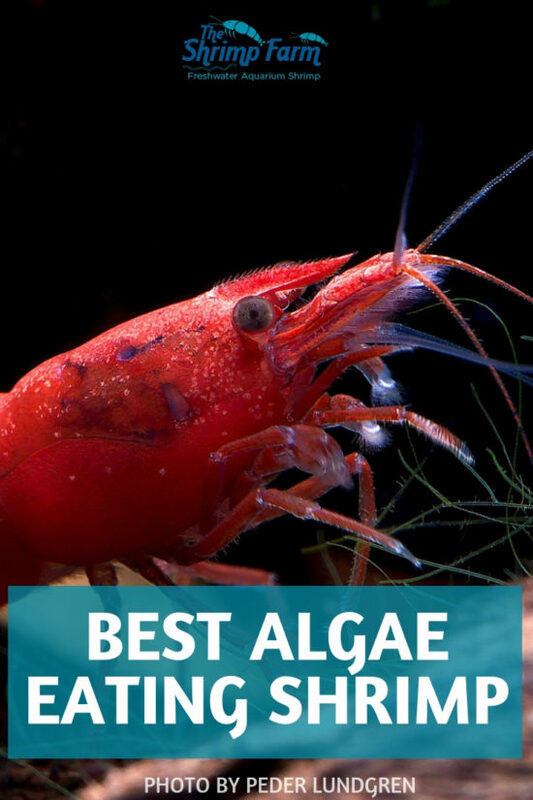 Keep reading to find out more about why shrimp love algae so much and a list of three algae eating experts! Almost all freshwater aquarium shrimp are naturally omnivores that will eat anything they can find. Their natural diet usually consists of biofilm that grows on rocks and plants, (decaying) plant matter, dead fish and other meaty foods and, of course, many types of algae, Specific diets vary between species, with some shrimp like the popular ghost shrimp being more avid scavengers while others specialize in algae and biofilm. As mentioned above, even with a shrimp cleaning crew you still can't always expect to skip the scrubbing altogether. Algae are a structural problem caused by a nutrient imbalance, which means they won't disappear entirely unless you figure out what exactly is going on and fix it. Take a good look at your lighting schedule (are the lights on for too long? ), plants (fast-growing plants can outcompete algae for nutrients) and water values (excess nitrate and phosphate can cause an algae explosion). Once those factors are all under control your shrimp can still help by picking off any algae that does pop up, which they do quite effectively. 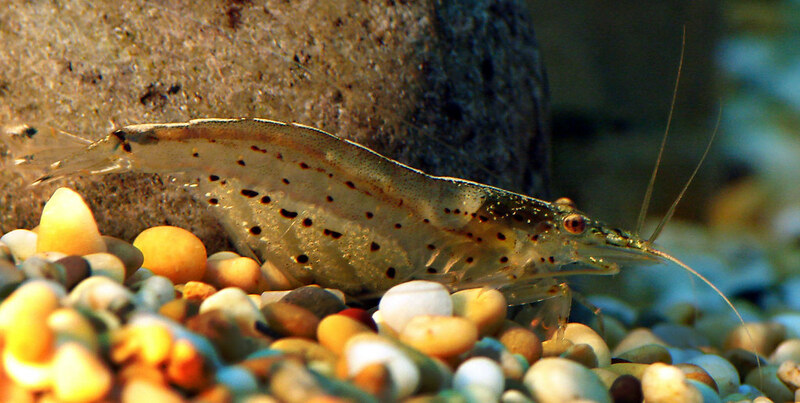 The Amano shrimp is such an effective algae eater one of it's common names is actually "algae eating shrimp"! With its transparent body this species might not be the most exciting to look at, but it is extremely popular due to being the go-to algae exterminator throughout the aquarium and aquascape hobbies. Amano shrimp aren't picky when it comes to algae and will eat almost any type, with black beard algae and cyanobacteria being the only common exceptions. A group of five should be enough to keep algae under control in tanks smaller than 20 gallons, while ten or more should work well for larger setups. Do keep in mind that a colony of Amano shrimp usually can't survive off algae alone and you'll have to provide them with additional food at least a few times a week. Pretty much anything works for this: high-end shrimp pellets, simple fish flakes or even some simple blanched peas, Amano shrimp will happily eat it all. You can buy Amano shrimp at The Shrimp Farm! Order your aquarium cleaning crew here. 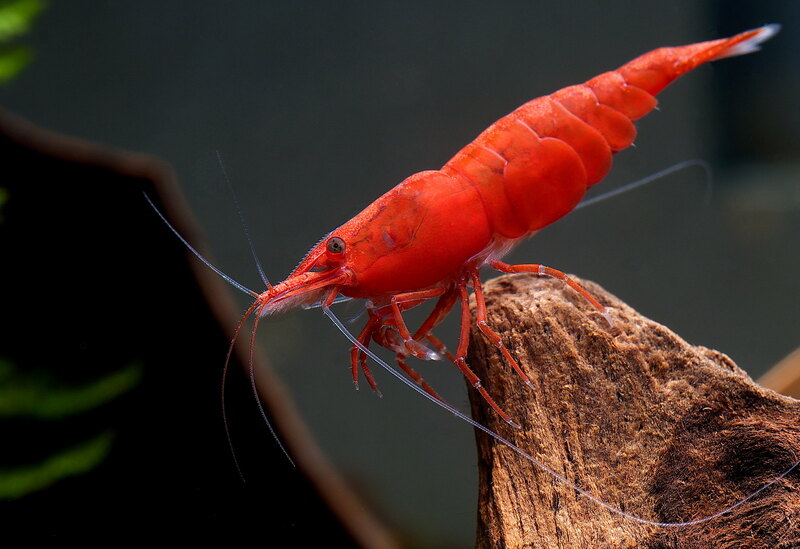 Probably the absolute most popular aquarium shrimp in the hobby, cherry shrimp are appreciated for their red coloration, fast breeding and efficiency when it comes to eating algae. 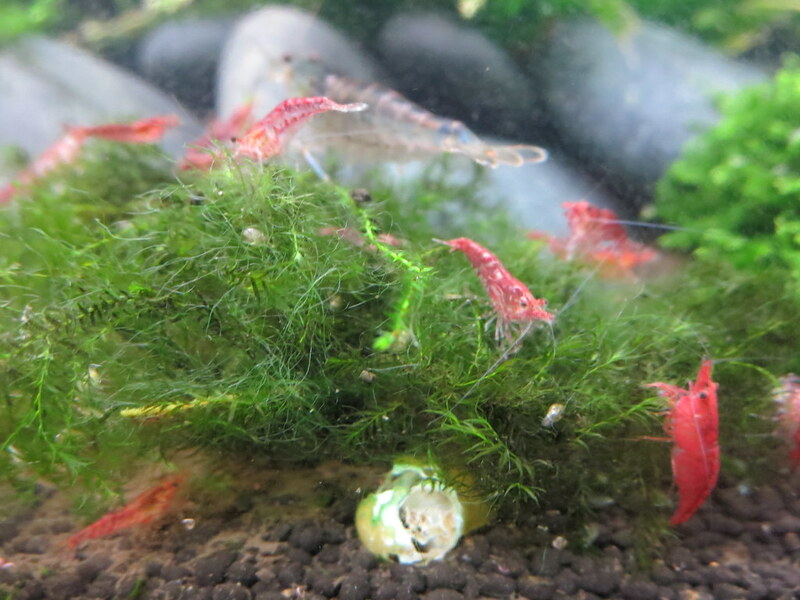 Like Amano shrimp they will eat various types of algae - and they do it quickly. Cherries spend their entire day foraging, eating algae and biofilm wherever they can find it. Just introduce a colony of at least ten cherry shrimp into your aquarium and sit back! They will multiply quickly, creating a larger and larger algae eating army. Overcrowding won't be an issue, as these shrimp have a low bioload and most aquariums can sustain dozens or even hundreds of them as long as you're offering additional foods regularly. If you do feel like your colony is expanding a bit too fast, just sell or give away a few shrimp to a fellow hobbyist. You can buy cherry shrimp at The Shrimp Farm! Order your cherries here. A more unusual addition to this short list of algae devouring shrimp is Caridina dennerli, also known as the cardinal shrimp. This species from Sulawesi is appreciated for its gorgeous colors but unfortunately not the easiest to keep due to their rather specific demands when it comes to water values. They are great algae eaters, though! In fact, a large part of Sulawesi shrimp keeping actually consists of deliberately growing hair algae, micro-algae and biofilm for them to feed on. Unfortunately, unlike Amano shrimp and cherry shrimp aren't one of those species you can plop into almost any type of aquarium as an algae cleaning crew. However, if you do happen to have a peaceful Sulawesi setup lying around be sure to consider them. They are sure to keep the aquarium super clean and are a fascinating and unique addition to your stock.